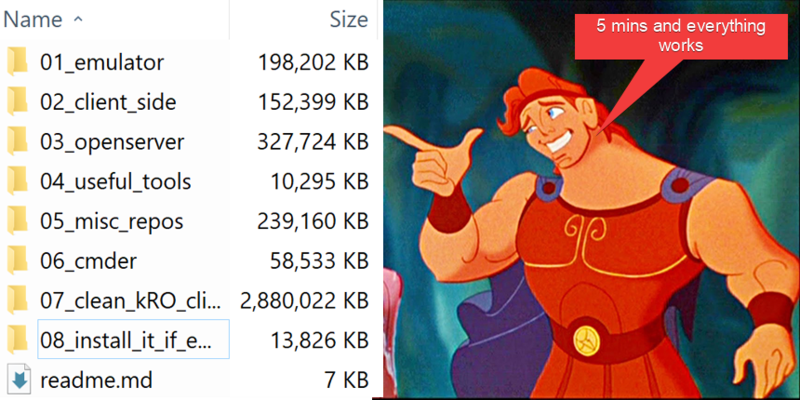 TL;DR: If you're a newbie, and want to launch a Hercules emulator and try it in 5 mins, just download everything here, extract, run OpenServer, Copy client files to kRO folder, run emulator, run client, login and play or do whatever you want to do. This pack already pre-configured and compiled, you need not do anything here, just download, extract, run. This is newbie package which contain 1 click solution for launching hercules emulator in a single click. This package only for education. Do not use this package anywhere in production. This package good demonstration of how everything should configured by yourself to make it work. 05_misc_repos = here are repositories from which it have built the client-side, and exe patched. 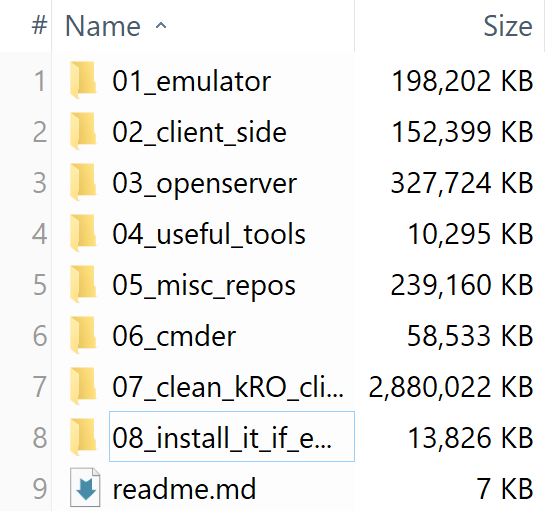 07_clean_kRO_client = this is clean kRO client (2018 somewhere in march updated), need for you to run your own RO copy. How to use all of this? Now what emulator version do you need? Latest (current official servers) (renewal mechanic (suras, dorams, etc classes)) or classic PRE-re (champion, high wizard, high priest)? c.) now go to 07_clean_kRO_client/clean_kRO_client/ folder and copy files here (overwrite if windows explorer will ask to do that). d.) now you need run OpenServer (it's server which store all your players data inside database, required by the emulator) and run it. e.) Click on Red Flag -> Run server, make sure in your tray you got Green Flag. Your emulator, your database, and the client are running. Now you can try to login in the game. If you want to add an extra account (create a new one). Open game client, in LogOn field, enters your login for your account what you want to register. And in password field enter your password what you want to have on this account. Now press enter, and it will create your account. If you will do it. You will create an account `myuser` with password: `mypassword`. Simple, is not it? You need none control panel for registration, it will work like that. How to make a GM account or how access database? Press enter or login, and you will be in the database. Databases well structured, so mostly always you need not edit too much there. How to make GM account? Now select your database, and find in this database table called: "login"
Open this table, and find your account name, and you will see column "group_id". Edit number in this column (group_id) to 99. 0-99 = your GM level. 99 = super admin with all privilegies, 0 = simple player with no privieleges. Okay, everything working for me, what can I do next? Do experiments and do not afraid to destroy everything or remove. Just do mistakes and errors, it's how people learning something new, though mistakes. DO not afraid to do a lot of mistakes and ask questions. People will help you if you will try to help yourself first and will make good questions with some research before posting messages. What tools can I use for making everything much easier for me? The solution what you will find by the link below is a terrible solution. But usable for a small group of people who for education only want to launch their server ONLINE (for others). This is SUPER bad, and never do that, (it's weird, after only time you will understand why). If they accept donations or not, I found none donation link. 4144 for massive help to current RO scene at all by his hard work. and to all guys, scripters, mappers, etc players who spend their time, their efforts just for you to make everything free what you see here. Sorry if I didn’t mention someone.